We aim to be a professional membership body that really listens to our membership. Membership surveys provide us with valuable insight into our Fellows’ and members’ perceptions of the College. This helps us to understand your experiences and make sure that we are providing the support and services you want. Following the success of the 2014 survey which provided the RCR with valuable insight into Fellows’ and members’ perceptions of the College, the decision was taken to carry out regular surveys to make sure that the College provides the support and services that members want. The 2018 Membership Survey built on the findings and themes of the 2014 and 2016 surveys. The next survey will be carried out in 2020. 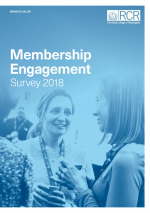 The report summarises the findings from the 2018 RCR Membership Engagement Survey, which was designed to understand with insight the needs and wants of the membership, as well as their satisfaction, experience and perceptions of the RCR and its activities. In addition to offering the membership the opportunity to give their opinions on the services, benefits and support the College offers, we were also keen to hear their views on any challenges they are currently facing in their working life. The questions about working life were motivated by a desire to understand what the membership believes are the most pressing challenges for the profession. The findings will help us continue to meet the needs and expectations of our members both now and in the future. There is a positive response from members towards the College throughout the survey. Members rate the College highly as a membership organisation; 70% of members think it is excellent or good. There is no major difference in responses between the specialties. There is a strong, consistent perception of the College. Leadership, education and support scores have improved over the three surveys. Most issues of concern to members in the 2016 Membership Survey remain the same in 2018. Being part of a respected professional body was ranked as the most important reason for becoming a member. Lack of time, inconvenient location and high financial cost are still the main reasons why members do not attend RCR events. 90% of members agree that it is important to share their views on policy issues with the College but one in two (49%) are unsure how to do this. Increasing external influence and profile remains a key challenge from RCR members. Members want the College to offer more online professional learning and development activities. The majority (76%) of members are satisfied with the communications they receive from the RCR. We take your feedback seriously and have looked carefully at the areas in which you think we can do more. We outline how your feedback will shape our activities over the coming years.